Monster High Freak du Chic Circus Scaregrounds Rochelle Goyle Doll Playset Was $40 Only $20! You are here: Home / Great Deals / Christmas Deals / Monster High Freak du Chic Circus Scaregrounds Rochelle Goyle Doll Playset Was $40 Only $20! 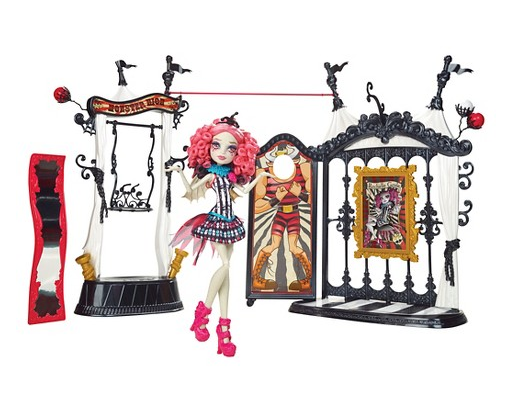 Monster High Freak du Chic Circus Scaregrounds Rochelle Goyle Doll Playset Was $40 Now Only $20! Head over to Target and order the Monster High Freak du Chic Circus Scaregrounds Rochelle Goyle Doll Playset Was $40 Now Only $20! Shipping is FREE! The ghouls, especially Rochelle Goyle as the Mime Magnifique (doll included), will love hanging at the Freak du Chic Circus Scaregrounds play set! There’s a working swing, a funhouse mirror and a Manny Taur photo cutout so all the ghouls can get bullish.